1. In a resealable bag, mix together the paprika, pepper flakes, olive oil, salt and pepper. Add the steak, seal bag and refrigerate up to overnight. 2. To cook the flank steak, heat a grill pan over high heat. Grill the flank steak, turning once, about 8-10 minutes total for medium-rare. Let steak rest before slicing. 3. While the steak is resting, slice the bread into thin slices. Toast the bread in the oven if you'd like. 4. Slice the steak very thinly (as thin as you can) ACROSS the grain. 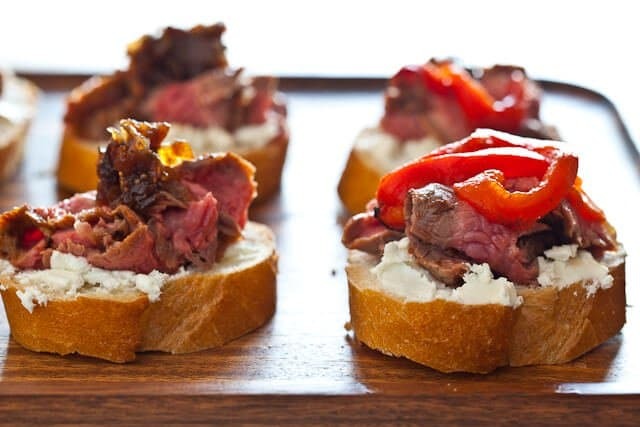 Top each toast with goat cheese, steak, a couple of red bell pepper slices and/or small spoonful of fig jam.